Live Music By Power House, April 19th @ 6:30pm-10:30pm, during Happy Hour with $4 Domestic Bottles & Mixed Drinks, $5 Wines & Taps, and $8 Apps! Join us for Easter Sunday Brunch with seatings stating at 11:30am and dinner seatings starting at 3pm. 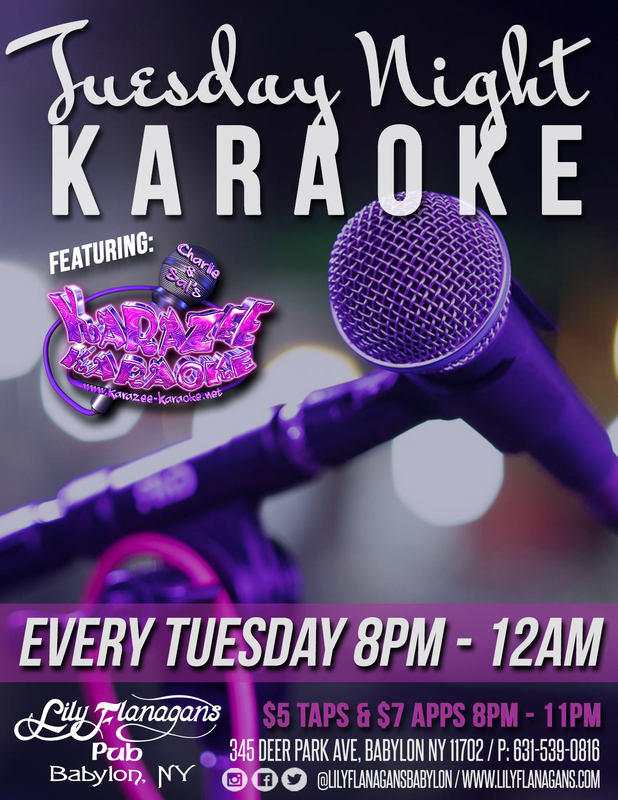 Every Tuesday Night join us for Karaoke with Karazee Karaoke in the Bar from 8pm - 11pm, with $5 Taps and $8 Apps, and Taco Tuesday Specials! 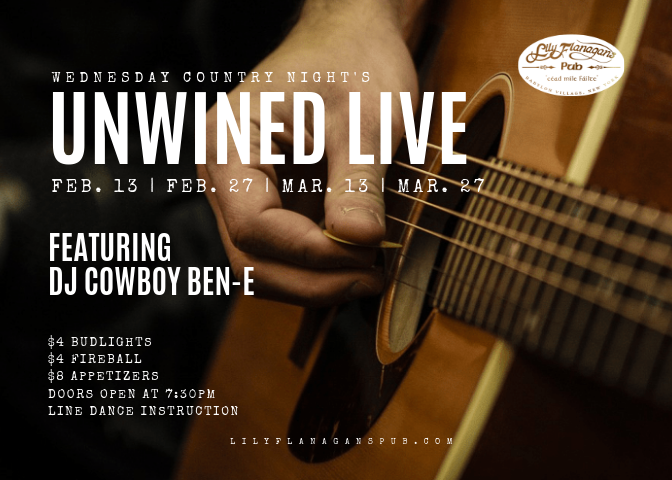 Join us for Country Night every Wednesday with DJ Cowboy Ben-E, Line Dance Instruction, and drink specials at the bar! Live Music By One Track Mind, April 26th @ 6:30pm-10:30pm, during Happy Hour with $4 Domestic Bottles & Mixed Drinks, $5 Wines & Taps, and $8 Apps! Live Music By No Request, May 3rd @ 6:30pm-10:30pm, during Happy Hour with $4 Domestic Bottles & Mixed Drinks, $5 Wines & Taps, and $8 Apps! Live Music By Beer Nutz, May 10th @ 6:30pm-10:30pm, during Happy Hour with $4 Domestic Bottles & Mixed Drinks, $5 Wines & Taps, and $8 Apps! Live Music By Tom’s Dad’s Band, May 17th @ 6:30pm-10:30pm, during Happy Hour with $4 Domestic Bottles & Mixed Drinks, $5 Wines & Taps, and $8 Apps! Live Music By Bus Duty, May 24th @ 6:30pm-10:30pm, during Happy Hour with $4 Domestic Bottles & Mixed Drinks, $5 Wines & Taps, and $8 Apps! Live Music By Bag of Bones, May 31st @ 6:30pm-10:30pm, during Happy Hour with $4 Domestic Bottles & Mixed Drinks, $5 Wines & Taps, and $8 Apps! Live Music By V.O.R. , June 7th @ 6:30pm-10:30pm, during Happy Hour with $4 Domestic Bottles & Mixed Drinks, $5 Wines & Taps, and $8 Apps! Live Music By One Track Mind, June 14th @ 6:30pm-10:30pm, during Happy Hour with $4 Domestic Bottles & Mixed Drinks, $5 Wines & Taps, and $8 Apps! Live Music By Tom’s Dad’s Band, June 21st @ 6:30pm-10:30pm, during Happy Hour with $4 Domestic Bottles & Mixed Drinks, $5 Wines & Taps, and $8 Apps! Live Music By No Request, June 28th @ 6:30pm-10:30pm, during Happy Hour with $4 Domestic Bottles & Mixed Drinks, $5 Wines & Taps, and $8 Apps! Live Music By Bus Duty, April 12th @ 6:30pm-10:30pm, during Happy Hour with $4 Domestic Bottles & Mixed Drinks, $5 Wines & Taps, and $8 Apps! Live Music By Beer Nutz, April 5th @ 6:30pm-10:30pm, during Happy Hour with $4 Domestic Bottles & Mixed Drinks, $5 Wines & Taps, and $8 Apps! Join us in helping us take back childhood from cancer & reaching our goal of $100k! Click the link below to join. Live Music By Killing Time, March 29th @ 6:30pm-10:30pm, during Happy Hour with $4 Domestic Bottles & Mixed Drinks, $5 Wines & Taps, and $8 Apps! 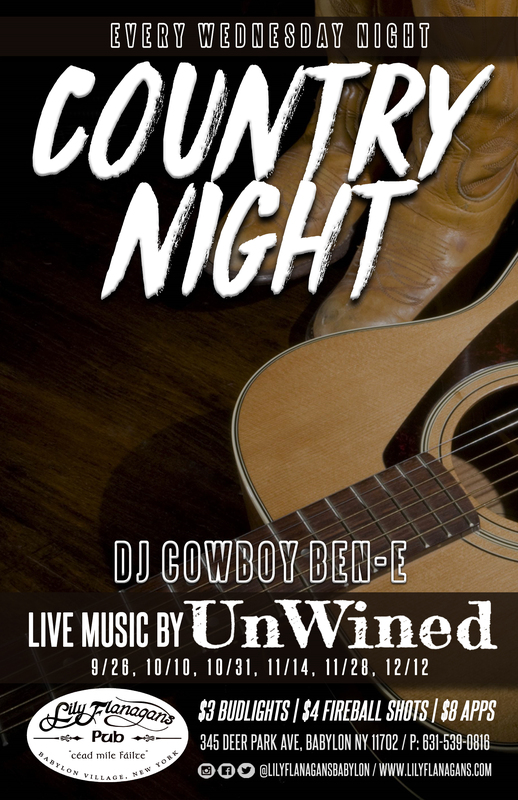 Join us for Country Night with Live Music by Unwined at 8pm. Live Music By Bag of Bones, March 22nd @ 6:30pm-10:30pm, during Happy Hour with $4 Domestic Bottles & Mixed Drinks, $5 Wines & Taps, and $8 Apps! Live Music By Tom’s Dad’s Band, March 15th @ 6:30pm-10:30pm, during Happy Hour with $4 Domestic Bottles & Mixed Drinks, $5 Wines & Taps, and $8 Apps! Live Music By Acoustic Blue, March 8th @ 6:30pm-10:30pm, during Happy Hour with $4 Domestic Bottles & Mixed Drinks, $5 Wines & Taps, and $8 Apps! Live Music By No Request Band, March 1st @ 6:30pm-10:30pm, during Happy Hour with $4 Domestic Bottles & Mixed Drinks, $5 Wines & Taps, and $8 Apps! Live Music By Beer Nutz, February 22nd @ 6:30pm-10:30pm, during Happy Hour with $4 Domestic Bottles & Mixed Drinks, $5 Wines & Taps, and $8 Apps! 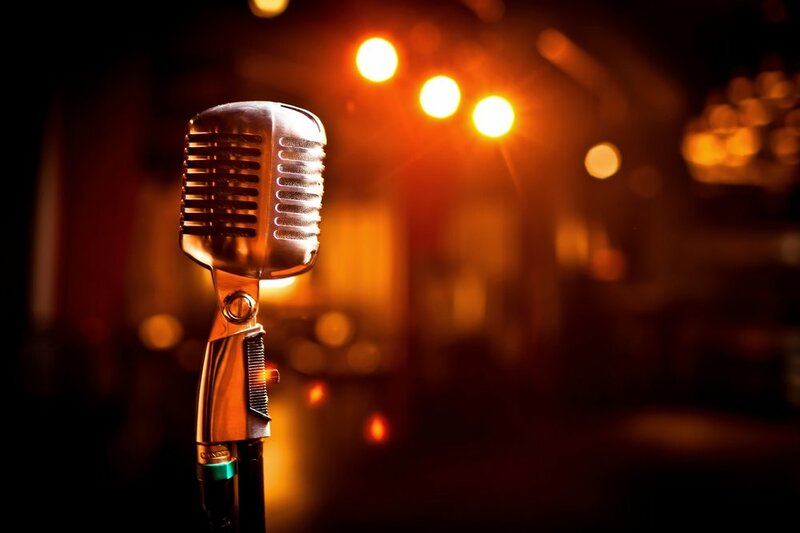 Live Music By Tom's Dad's Band, February 15th @ 6:30pm-10:30pm, during Happy Hour with $4 Domestic Bottles & Mixed Drinks, $5 Wines & Taps, and $8 Apps! Live Music By One Track Mind, February 8th @ 6:30pm-10:30pm, during Happy Hour with $4 Domestic Bottles & Mixed Drinks, $5 Wines & Taps, and $8 Apps! Live Music By Bus Duty Friday, February 1st @ 6:30pm-10:30pm, during Happy Hour with $4 Domestic Bottles & Mixed Drinks, $5 Wines & Taps, and $8 Apps! Every Wednesday Night Join us for Country Night with DJ Ben-E, Line Dancing Instruction, occasional Live Music, $3 Budlight Bottles & $4 Fireball Shots!